Friday Nov 3, 6pm; Saturday Nov 4, 2pm. KW Atrium Studio, 111 W. Hastings. Theatre Terrific presents Breath-Ahhh, a rhythmically explosive performance, comprised of dance, imagistic gestures, self-expressed soundscape and variations of emotion that explore the universal truth…that breath is something we all share. Created by Artistic Director Susanna Uchatius in collaboration with the all-inclusive cast. Registration Fee: $260 (price includes tax) per person includes: 2 nights and 3 days accommodations, healthy meals, registration, all workshops, recreation, and FUN. About the Event: To learn more about self advocacy; safety; rights; healthy relationships; become leaders in your own Community; etc. About the Event: Spend a funny and engaging evening with a man who will share his life experience with Autism with you. 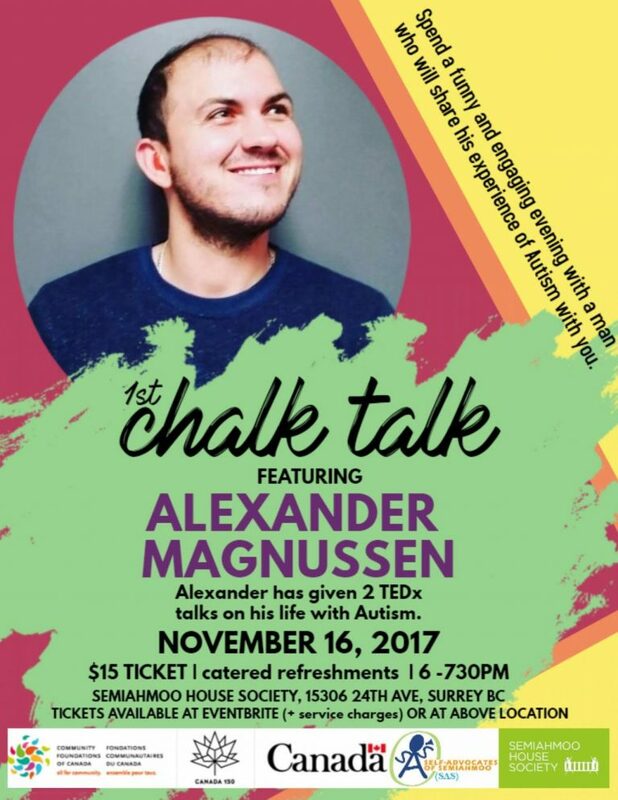 Alexander has given 2 TEDx talks on his life with Autism. The 1.5 hour event features Alexander for 45 minutes followed by a catered reception. This initiative is made possible by the Community Fund for Canada’s 150th, a collaboration between the Self-Advocates of Semihamoo, Semiahmoo House Society, the Government of Canada, and extraordinary leaders from coast to coast to coast.